Tessa was born in Suffolk and spent her early career in London working in marketing and event management for a number of different publishers and a children’s charity. She now lives in deepest rural Cornwall in an old farmhouse with her second husband and their cocker spaniel. She loves gardening, football and baking and has a passion for fashion and interior design. Tessa wanted children. At least two, possibly three but her body simply wasn’t playing ball. She embarked on the relentless treadmill of infertility treatment but to no avail. Tessa remained childless. Despite this, we live in a world where women are still often defined by their fertility, and Tessa can still struggle to answer the simple question ‘Do you have children?’. 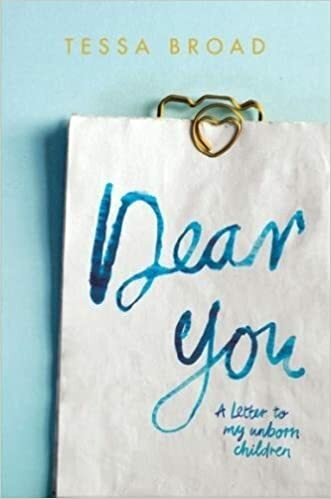 The highs and lows, tears and laughter she describes in Dear You will give comfort and home to anyone touched by infertility. Well, this book was a bit close to home. I know I now have two children, but initially I had a long struggle to conceive my two small humans. I had come to terms with the fact that I would be childless. This book is brutally honest, but with compassion – a book, I feel couples who are currently either going through fertility problems or have made the decision to stop trying should read as they will realise you are not alone. Tessa’s story is so familiar it made me smile quite a lot and I made my husband read parts of the book as I was getting a sense groundhog day. I hope Tessa continues to raise awareness around infertility as it remains a subject people do not want to talk about, and can be a lonely, daunting process which very few people understand. I laughed, nodded in agreement and cried whilst reading this book and by the end angry at the ignorance people have not just joe blogs general public but even health professionals lack any empathy at how you feel during your “fertility journey”. I just want to applaud Tessa and hope health professionals use your book and Tessa as an amazing resource to support couples going through fertility treatments to give a helpful insight to what it is really like. Well done Tessa !!!! Tessa’s website is available here.